WOW! I have had 200,000 hits! 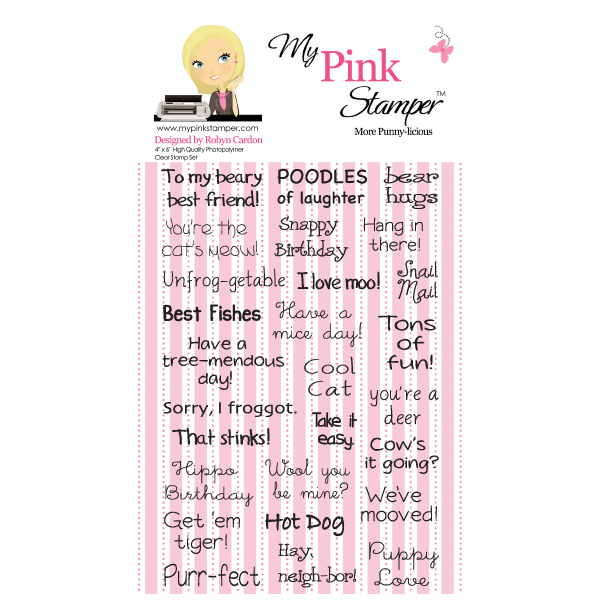 So how about a giveaway, sponsored by My Pink Stamper!! One person will win More Punny-licious! One person will win Family & Friends! 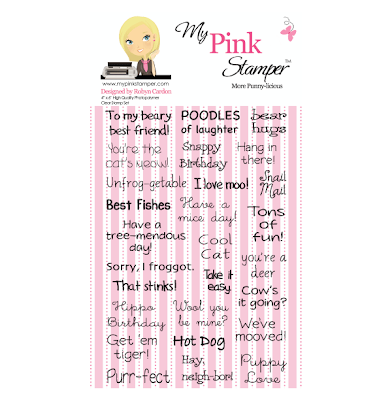 Thanks to Robyn- My Pink Stamper for sponsoring this giveaway! Thanks to all of you for visiting my blog and for letting me share my creations with you! I will draw two names using Random.org on Wednesday. Just leave a comment on this post with a way for me to get a hold of you! Congratulations! Your site is great. Thanks for offering a great giveaway. Love to win. Karlee, congrats on hitting 200,000! Congrats! and thanks for the chance to win!! Congrats on 200000 hits. That is a big accomplishment. Thanks for the chance to win also. Congratulations Karlee! You go girl!! And thank you Robyn for sponsoring the giveaway. Congratulations Karlee - you are doing a great job. Awesome!! Thank you for taking the time out to blog!!! Congrats! Thank you for the chance to win. Congrats Karlee! You'll be up to 500,000 in no time! Thanks to you and Robyn for the giveaways! Congrats Karlee! Thank you for sharing all of your fun crafts. I love them. Keep em coming. congratulations Karlee! Here's to another 200,000. Great giveaway! Thanks Karlee & Robin! Congratulations! I am not surprised---you have an awesome blog! wow, that's pretty cool all those hits. Thanks for the opportunity to win one of Robyns cools stamp sets. I have yet to get my hands on any of them. Congrats on your 200,000 hits!!! Congrats Karlee! Love your blog & Robyn's stamps. congrats Karlee on that amny hits.and hpow swett that you are giving away MPS stamps..
That is fabulous Karlee!!! Way to go girl. WOW - congratulations. Hope you are having some crafty fun today. Thank you Karlee and MPS for the giveaways!! Wow, you are so popular in the crafting world! Thanks for sharing all your creativity! Congrats on your hit count! Thanks for the fun give-away! Congrats on 200,000 ~ that is awesome! I would love to be a winner! Congratulations!! Thanks for the chance to win the AWESOME stamps! WOW!! Congrats!! Thanks for the opportunity to win. It's nice gifts, and congrats. Congrats Karlee and thank you Robyn for sponsoring her giveaway! Congrats Karlee!! I love your BLOG! Yeah!!! Thanks Karlee and Robyn, love give aways. !!!! Congrats on all the hits! I love your blog. Thanks for the chance to win! Congratulations Karlee on your number of hits on your site! Thanks for sharing your cool projects. Congrats karlee. I really like the things that you come up with. Thank you for the giveaway. Congrats on 200,000! How exciting! Congratulations!! What a good BFF to sponsor a give away for us! Hope you got your scrap room all squared away, wish you would come and help with mine lol. Congrats Karlee and thanks to Robyn! 200,000 hits is very impressive. Great giveway as well. I've been wanting to try her stamps. Thanks for posting your ideas and videos. Please keep those coming. Also, post pictures of your room when you are done organizing it. Always looking for organizing ideas. I love your blog...you enthusiasm jumps out of the screen! Thank you and Robyn for the great giveaway! Congrats on the 200,000 hits. Im sure there will be millions more to come. Gloria C.
CONGRATS ON 200,000!!!!! Looking forward to seeing pics of your craft room again. Tell Robyn thanks for sponsoring the giveaway. Hope I win. yay congrats!!! that is great news! Congrats Karlee!!! You'll hit a million before you know it. I would love to win! 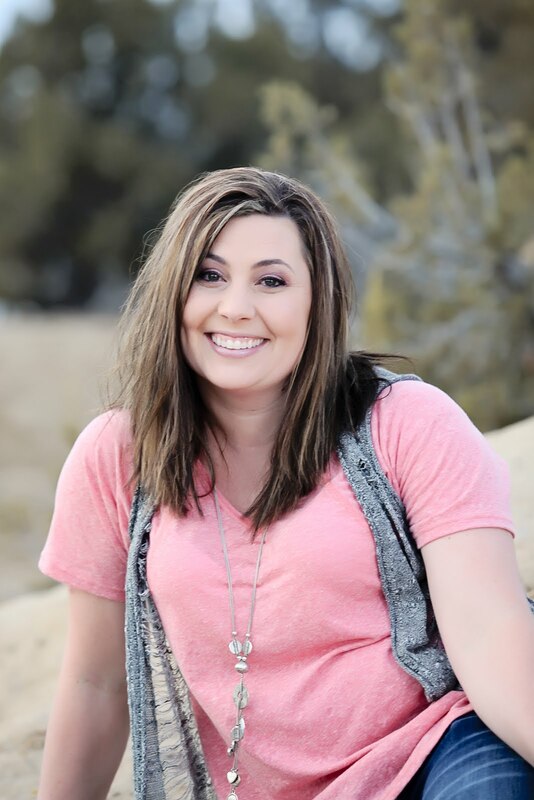 Congrats on the success of your blog, Karlee! Karlee, Congratulations on reaching 200,000 hits! Congrat Karlee, Keep up the good work. Hip hip hooray for Karlee! Love your site. Thanks for the opportunities. Keep up the good work love your site. Congrats on hitting the 200,000 mark! How exciting for you. And thanks for the giveaway chance. That's awesome! Thanks for such a fun blog. I LOVE your site.Keep doing it please.!!!! Awesome...Thanks for the chance to win Karlee! I have been wanting to try out Robyn's stamps! That is fantastic Karlee! Congratulations! Congrats to you Karlee. That is fantastic. Congratulations Karlee! Thanks to you and Robyn for the chance to win. I love her stamps and don't have either of these sets!! Wow! Congratulations Karlee! Thanks for sharing the joy!! Congrats Karlee! Thanks for the giveaway and thanks to Robyn for sponsoring it. Congratulations! Thanks for all you share! Way to go Karlee : )! Congrats. Boy that was quick. You are very popular. You're such an inspiration and wonderful crafter! Thanks for sharing with us! Congratulations on the 200,000 hits! Congrats on the 200,000 -- gosh that didnt take you long!!!! Thanks for the opportunity to win one of these wonderful sets!! Congrats on the 200,000! Can't wait to see more! That is sooo awesome! Congrats on the 200,000 hits! Thank you for sharing your talent with all of us!!!! OOOOO.... I don't have either of those! Thanks for the chance! Wow moving on up and shooting for the stars! So excited for you, Karlee!! You are doing a great job with your blog! Have a fabulous week! Congrats on 200,000 hits! You make such cute projects, thanks for sharing them with us. Karlee, thats awesome!! Thanks for sharing your idea and for the great giveaway!! Congrats Karlee...That is awesome. I can't tell you how much you Bind-It-All video helped me. Thanks for the giveaway. Congratulations on 200,000! Thanks for sharing all of you projects with us and thanks for a great giveaway! Congrats on your 200,000 hits and the success of your blog. Congrats on 200,000 hits! Amazing!! thanks for the chance to win those great stamps!! I don't have either of them! TFS! Congratulations on the 200000 hits thats awesome!! Congrats on the 200,000 hits!! You and Roybn remind me of my BFF and me!! Congratulation. You do a wonderful work and you`re so nice. Woo Hoo!!! You go girl!!! WOW that is great!! Congrats on your hits. Congrats Karlee! Thanks for the chance to win! Congrats!! Love watching you and Robyn together. Thanks for the great give away good luck everyone. Wow thats fantastic Karlee, here's to the next 200,000. Yeaaaa!!!!!!!!!!!!! great job I love visiting you blog. Thanks for all the creativity. Congrats! We share a love for the same fave color. congratulations that is wonderful! Thanks for the giveaway and to Robin too! Yeah I am excited about 200,000 hits :) Congrats! That is so awesome Karlee. I am so thankful for Robyn and you...as crafters and inspirations at moms too. Congrats Karlee - woot woot!!! Just wanted to say that I enjoy these blogs! Congratulations !!! I love watching your videos and seeing your projects. Congratulations! That is awesome :) Keep up the great work! Congrats on 200,000 hits Karlee! Love MPS stamps! I love your blog. Congrats on the 200,000! That is an awesome # of hits!! Congrats! I just got introduced to MPS stamps and I love them!! Congrats on the 200,000 hits Karlee and thanks for the chance to win one of Robyn's stamp sets (have the original Punny-licious set and love it!). Woohoo! Way to Go! Thanks for the giveaway, and all the great ideas! I'm making a memo board with my BFF like the one you did in a video at this very moment!! Congrats on 200,000! Love your blog and would love to win either one of these great prizes! Congrats!! I wish I had a BFF as great as Robin! I love your blog. Maybe now that school is back in session I can get back to my blog. Congrats Karlee! Now only if my blog could get that many :). Congratulations Karlee on hitting 200,000! I love visiting to see what's new! Thank to you and Robyn for the wonderful giveaway! Congrats on 200,000 hits! I love your projects! Thanks for sharing. Congrats on 200,000 hits! Thanks for the chance to win a great giveaway! Congratulations Karlee!!! 200000 is a great achievement in such a short time! WOW! Congrats! And to think I'm excited about approaching 500 hits on my blog. LOL! I can't imagine 200,000! Thanks for the chance at a great giveaway! Congrats on 200,000 hits!!! Thanks for the great giveaway!!! Congratulations !!! keep the projects coming !! Thanks for the giveaway!!! Congrats,keep up the wonderful work. Love your tips and projects thanks. 200,000 Congratulations Karlee! I love your blog! Congrats!! Thanks for a chance to win!! I have followed you and Robyn for sometime now. I would so love to win a set of her stamps. I am new to stamps and just did and posted my first card today with a stamp that was not words. If you get a chance take a look and leave a comment. Robyn and a few others were why I started. 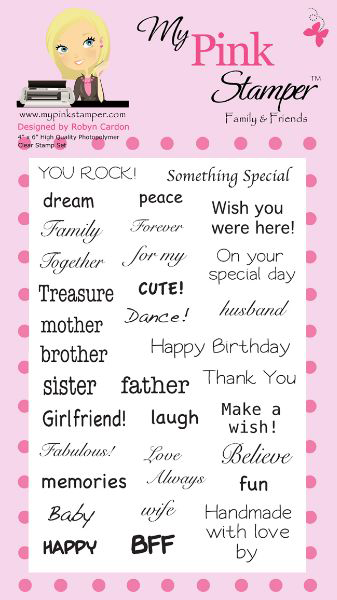 My blog is small.http://lovethatexpressions.blogspot.com/g cards. Thanks for all you both do. Congrats! Thanks so much for the giveaway! Love your blog...love Robyn's site and blog....you guys are such fun! I would love to live near EITHER one of you! I love Robyn's stamps! i'm so happy for you and your blog! way to go! Congratulations on reaching 200,000, that is very exciting! Good luck on your next 200,000!!! Way to go Karlee,I love your picnic scrapbook layout! Thanks for the chance to win! Congrats on your 200,000 hits, that is awesome!! Thanks for the chance to win. 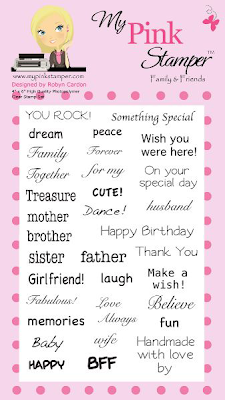 Thanks for the great giveaway, I just love Robyns' stamps!!! Congrats on hitting 200,000! !